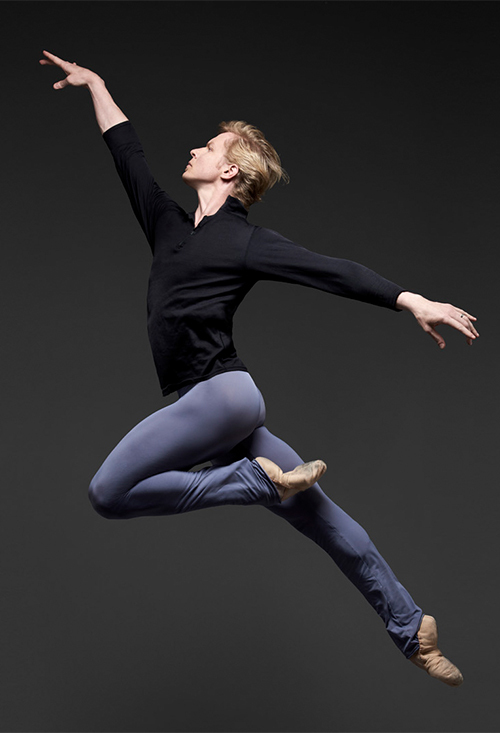 A former principal dancer at Royal Birmingham Ballet, Tiit Helimets has danced major roles in Tomasson’s Giselle (Albrecht), Nutcracker (Grand Pas de Deux Prince), The Sleeping Beauty (Prince Desiré), and Swan Lake (Prince Siegfried and Von Rothbart); Tomasson/Possokhov’s Don Quixote (Basilio); Cranko’s Onegin(Gremin); Neumeier’s The Little Mermaid (Prince); Scarlett’s Frankenstein (Alphonse Frankenstein); and Wheeldon’s Cinderella (Prince Gillaume). He created principal roles in Caniparoli’s Doublestop, Ibsen’s House, and Tears; King’s The Collective Agreement; Liang’s The Infinite Ocean; Possokhov’s Swimmer(Humbert); and Wheeldon’s Ghosts. His repertory includes Ashton’s Symphonic Variations; Balanchine’s Agon, Apollo, Allegro Brillante, Diamonds, Divertimento No. 15, The Four Temperaments, Scotch Symphony, Serenade, Stravinsky Violin Concerto, and Symphony in C; Bintley’s The Dance House; Bubeníček’s Gentle Memories; Forsythe’s in the middle, somewhat elevated; Liang’s Symphonic Dances; Lifar’s Suite en Blanc; MacMillan’s Winter Dreams; van Manen’s Variations for Two Couples; McGregor’s Borderlands, Chroma, and Eden/Eden; Millepied’s The Chairman Dances—Quartet for Two; Nureyev’s Raymonda—Act III; Possokhov’s Firebird and Magrittomania; Ratmansky’s Russian Seasons, Seven Sonatas, and Shostakovich Trilogy; Robbins’ Glass Pieces and In the Night; Tomasson’s 7 for Eight, The Fifth Season, On a Theme of Paganini, Prism,and Trio; and Wheeldon’s Continuum.